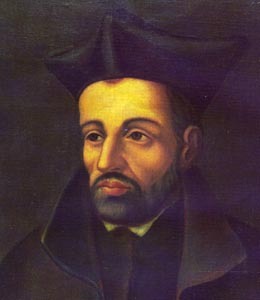 When Pope Francis spoke with Jesuit Father Antonio Spadaro of La Civiltà Cattolica he spoke in a definite manner of his admiration for the person and charism of Blessed Peter Faber, a 16th century Jesuit and close collaborator of Saint Ignatius of Loyola. This was likely the first time many heard of Peter Faber. Blessed Peter was an early companion of Loyola and was the first of the early founders to be ordained a priest. Moreover, it ought to be recalled that Faber was a master in giving the Spiritual Exercises. It is expected that Pope Francis will canonize Faber (1505-1546) in December. This papal act is clearly more important for the Society of Jesus than for others in the Church unless they have a devotion to the Spiritual Exercises. I welcome this canonization for the same reasons that others speculate that move Pope Francis. The procedure of canonization is an act of infallibly of the Pope. The decision has been made. He has deemed the canonization will happen without a certified second miracle is not without precedent. Pope Benedict did the equivalent canonization for Hildegard of Bingen while making her a Doctor of the Church at the same time. Pope Francis waived the second miracle for Blessed John XXIII. Other examples are cited in the article below. The papal pen writes many things, even bulls of canonization. Pierre Faber, a “Reformed” Jesuit priest whom Francis sees as a model figure, is to be proclaimed as saint before Christmas, Stefania Falasca reports in an article for Italian Catholic newspaper Avvenire. The process for his cause in the Congregation for the Causes of Saints is complete and now all that remains is for Francis to issue the Bull of Canonization that will proclaim the first companion of St. Ignatius a saint, extending the cult of the soon-to-be-saint to the Universal Church. Faber was born in the Upper Savoy region of France in 1506 and died in Rome in 1547 just a few weeks before he was due to attend the Council of Trent. He was beatified in September 1872 with a Papal Rescript issued by the Sacred Congregation of Rites and ratified by the Society of Jesus. Now Francis is extending the liturgical cult to the Universal Church. The process followed for Faber’s canonization is called “equivalent canonization”. This is when the Pope omits the judicial process and ceremonies involved and orders a servant of God to be venerated in the Universal Church, when such a saint has been from a remote period the object of veneration, when his heroic virtues (or martyrdom) and miracles are related by reliable historians, and the fame of his miraculous intercession is uninterrupted. “Examples of this in recent history include John Paul II, who decreed 3 such canonizations, Benedict XVI who decreed 1, the last of which was that of Angela da Foligno, confirmed last 9 October by Pope Francis,” Avvenire writes.